Chevrolet has created a vision of what it thinks a full autonomous all-electric vehicle of the future might look like. 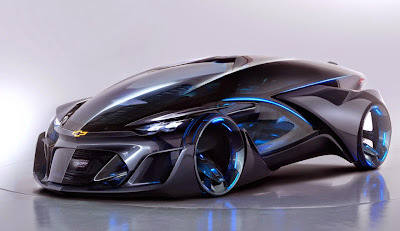 Created by GM’s Pan Asia Technical Automotive Center the Chevrolet-FNR is an autonomous electric concept vehicle that boasts a futuristic capsule design. It has crystal laser headlights and taillights and dragonfly dual swing doors. The Chevrolet-FNR features an extreme aero design optimised for low drag with braking and propulsion provided by all-wheel-drive magnetic hubless electric wheel motors along with autonomous wireless charging. A laundry list of imaginary range and power output specifications have not been provided. The Chevrolet-FNR is loaded with a range of sensors like roof-mounted radar that can map out the environment to enable driverless operation, Chevy Intelligent Assistant and iris recognition start. The Chevrolet-FNR can also serve as a “personal assistant” to map out the best route to the driver’s preferred destination.